Reading the quick tour first is recommended. That includes a simple example of FST application using either the C++ template level or the shell-level operations. The advanced usage topic contains an implementation using the template-free intermediate scripting level as well. With these files and the descriptions below, the reader should be able to repeat the examples. With about 340,000 words in The War of the Worlds, it is a small corpus that allows non-trivial examples. For the most part, we illustrate with the shell-level commands for convenience. Files with a .fst extension should be produced from their text description by a call to fstcompile. This is illustrated at the beginning, but is often implicit throughout the rest of this document. is a transducer that deletes common punctuation symbols. The full punctuation transducer is here. Note that our construction of lexicon.fst requires that all tokens be separated by exactly one whitespace character, including at the end of the string (hence the '!' in the previous example). To generate a full lexicon of all 7102 distinct words in the War of Worlds, it is convenient to dispense with the union of individual word FSTs above and instead generate a single text FST from the word symbols in wotw.syms. Here is a python script that does that and was used, along with the above steps, to generate the full optimized lexicon (which you should compile to lexicon_opt.fst). The above tokenization does not handle numeric character input. (b) Incorporate this transduction into the letter-to-token transduction above and apply to the input Mars is 4225 miles across. represented as letters. downcases the letters in the lexicon from the previous example. (a) upcases letters that are string-initial or after a punctuation symbol/space (capitalization transducer). (b) converts lowercase underscore-separated identifiers such as num_final_states to the form NumFinalStates (CamelCase transducer). (a) The letter-level downcasing transducer downcases any ASCII input. For which inputs does the token-level downcasing transducer work? What changes would be necessary to cover all inputs from wotw.syms? (b) If a token The were applied to downcase_token.fst, what would the output look like? What would it look like if the optimizations (epsilon-removal, determinization and minimization) were omitted from the construction of downcase_token.fst. Create a 1,000,000 ASCII character string represented as an FST. Compose it on the left with downcase.fst and time the computation. Compose it on the right and time the computation. The labels in downcase.fst were pre-sorted on one side; use fstinfo to determine which side. Use fstarcsort to sort downcase.fst on the opposite side and repeat the experiments above. Given that composition matching uses binary search on the sorted side (with the higher out-degree, if both sides are sorted), explain the differences in computation time that you observe. This model is constructed to have a transition for every 1-gram to 5-gram seen in 'War of the Worlds' with its weight related to the (negative log) probability of that n-gram occurring in the text corpus. The epsilon transitions correspond to backoff transitions in the smoothing of the model that was performed to allow accepting input sequences not seen in training. # Before trying this, read the whole section. In other words, the most likely case of the input is determinized with respect to the n-gram model. The relabeling of the input labels of the language model is a by-product of how the lookahead matching works. Note in order to use the lookahead FST formats you must use --enable-lookahead-fsts in the library configuration and you must set your LD_LIBRARY_PATH (or equivalent) appropriately. (a) Find the weight of the second shortest distinct token sequence in the prediction example above. (b) Find the weight of the second shortest distinct token sequence in the prediction example above without using the --nshortest flag (hint: use fstdifference). (c) Find all paths within weight 10 of the shortest path in prediction example. (a) The case restoration above can only work for words that are found in the text corpus. Describe an alternative that gives a plausible result on any letter sequence. (b) Punctuation can give clues to the case of nearby words (e.g. i was in cambridge, ma. before. it was nice.). Describe a method to exploit this information in case restoration. Create a transducer that converts the digits 0-9 into their possible telephone keypad alphabetic equivalents (e.g., 2: a,b,c; 3: d,e,f) and allows for spaces as well. Use this transducer to convert the sentence no one would have believed in the last years of the nineteenth century that this world was being watched keenly and closely into digits and spaces. Use the lexicon alone to disambiguate this digit and space sequence (cf. T9 phone input). Now use both the lexicon and the language model to disambiguate it. If this is computed on letters, it is called the letter error rate; on words, it is called the word error rate. 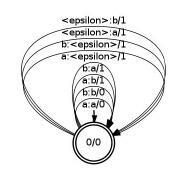 This counts any substitution (a:b, b:a), insertion (<epsilon>:a, <epsilon>:b), or deletion as (a:<epsilon>:a, b:<epsilon>) as 1 edit and matches (a:a, b:b) as zero edits. For word error rate, we use the Levenshtein edit distance, i.e. where the cost of substitutions, insertions, and deletions are all the same. However, each pairing of a symbol (or epsilon) with another symbol can be given a separate cost in a more general edit distance. This can obviously be implemented by choosing different weights for the corresponding edit transducer transitions. Even more general edit distances can be defined (see Exercise 8). Note that if the hypothesis is not a string but a more general automaton representing a set of hypotheses (e.g. the result from Exercise 5c) then this procedure returns the oracle edit distance, i.e., the edit distance of the best-matching ('oracle-provided') hypothesis compared to the reference. 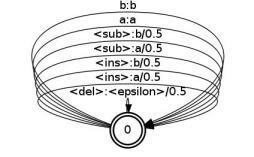 The corresponding oracle error rate is a measure of the quality of the hypothesis set (often called a 'lattice'). There is one serious problem with this approach and that is when the symbol set is large. For the 95 letter ascii.syms, the Levenstein edit transducer will have 9215 transitions. For the 7101 word wotw.syms, there would need to be 50,438,403 transitions. While this is still manageable, larger vocabularies of 100,000 and more words are unwieldy. These transducers include new symbols <sub>, <del>, and <ins> that are used for the substitution, deletion and insertion of other symbols respectively. In fact, the composition of these two transducers is equivalent to the original edit transducer edit.fst. However, each of these transducers has 4 |V| transitions where |V| is the number of distinct symbols, whereas the original edit transducer has (|V|+1)2-1 transitions. With large inputs, the shortest distance algorithm may need to use inadmissable pruning. This is because the edit transducer allows arbitrary insertions and deletions, so the search space is quadratic in the length of the input. Alternatively the edit transducer could be changed (see Exercise 8b). With more general edit transducers, this factoring may not be possible. In that case, representing the edit transducer in some specialized compact FST representation would be possible but pairwise compositions might be very expensive. A three-way composition algorithm or specialized composition matchers and filters are approaches that could implement this more efficiently. As an example, we can see to what extent the case restoration transducer errs on a given input by computing the edit distance between the output it yields and the reference answer. We will use the Levenshtein distance. First, generate edit1.fst and edit2.fst. These should be structured like the example above, but should provide transitions for each symbol of ascii.symb not just 'a' and 'b'. You will need to create levenshtein.symb which contains the definitions of ascii.symb plus new definitions for "<ins>", "<del>" and "<sub>". Then, prepare the transducers edit1.txt and edit2.txt as above from ascii.symb, and compile them (edit1.fst would have ascii.symb as input symbols and levenshtein.symb as output symbols, and vice versa for edit2.fst). Create a transducer ref.fst representing a correctly capitalized English sentence using words from the corpus and with adequate whitespace. You might want to use words which appear both capitalized and uncapitalized in the source text to have a chance to observe a non-zero edit distance. A suitable (nonsensical) example is the following: "The nice chief astronomer says that both the terraces of the south tower and the western mills in the East use the English Channel as a supply pool "
You can now downcase ref.fst (with the full_downcase.fst transducer presented above), apply case_restore.fst to it and get the hypothesis output for this input (as was explained in the section about case restoration). Compose that with the reversed tokenizer to get the hypothesis represented as a sequence of characters not tokens. This is hyp.fst, which should be a FST representing a string along the lines of "The Nice chief Astronomer says that both the terraces of the south Tower and the western Mills in the east use the English channel as a Supply Pool ". (a) allows only a fixed number N of contiguous insertions or deletions. (b) computes the Levenshtein distance between American and English spellings of words except that common spelling variants like -or vs -our or -ction vs. -xion are given lower cost. (a) compute the error rate rather than the edit distance using transducers. (b) compute the oracle error path as well as the oracle rate for a lattice.